Think of this is the mini Churchill, half the tank capacity (2ml), a much more restricted airflow, and 510 drip tip compatibility. A lot the design and aesthetics remain and unchanged, and for good reason, why fix something that ain’t broke? The design is the same great execution of great thinking. A postless deck with an easy snap on chamber that aligns your wicks perfectly. Clean lines and the ability to fill from the top without removing the drip tip (nice improvement). Same characteristic yellow ultem tank, same great heat dispersion to keep things cool. Same great wicking with super saturated wicks all the time. There is nothing bad to say really, the Perla is the smaller MTL version of the Churchill, that’s all there is to it. But wow does it do the job well. Flavour is on point, thanks to those saturated wicks from the great juice channels. The Perla is shorter and the chamber is slight reduced in diameter from the original (18mm) making for possibly better flavour if possible. The Airflow is set up for MTL, it’s tight yet silky smooth. 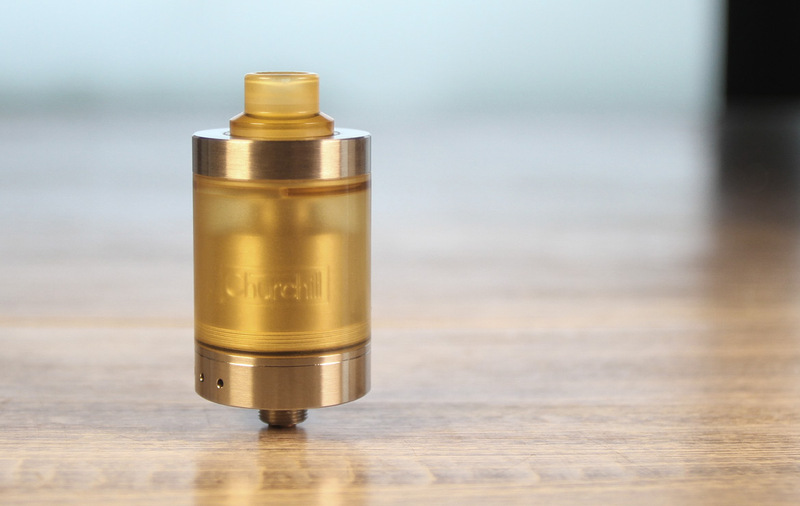 The Perla included three peek airflow reducers the slot in below your coil. We like the largest of the three as it travels the distance of our coils. The AFC has 4 1mm holes and you can really tighten the draw if that’s what you are looking for. For us the AFC wide open works great. Building is the same ridiculously ease procedure. Wrap and snip your coils to length and tighten down on the postless deck. In single coil center it above the airflow, for dual pull each coil towards the center to get over the airflow as much as possible without touching coil to coil. We have been playing with dual setups with an inter-diameter of 2.5mm and wrapped about 7-8 times. Currently we are liking a 26 awg build ohming in at around 0.3 ohms but run low at 24W. We get some nice dense vapor with quite a throat hit. We just can’t get over the engineering of the chamber section and how it helps push your wicks into place (just brilliant thinking). Wicking by now as you should expect is a treat. Cut them to be inline with the inner deck, fluff them and align slightly for the sides of the deck and then push down the chamber section. We like to clean things up a little with a wick pick (not necessary though). We haven’t experienced an ounce of trouble. Juice capacity is only 2ml but when vaping higher nic salts 2ml lasts a long time (easily half a day of heavy vaping). Our only gripes are the juice port is a little tight, you need to pay close attention and place your bottle or dropper to the far edge and keep it upright to allow for air to escape the other side of the same opening. And as same as the original Churchill, the top of the tank threads are plastic (Ultem) so be very careful not to cross-thread them. The first Churchill blew our minds a little with the originality of thought (check out our Churchill review for more) and that doesn’t mean we don’t appreciate the Perla. Far from it actually, the Perla is much close to our preferred style of vaping to be honest. Everything about this atty is great. It’s just with how the market progresses, the price tag is a little steep for some for sure. If only this could be even an $80 tank, I think it could open up more potential for this awesome product. But hey, price aside, the Perla might be the small brother, but it might just be the better of the two in our humble opinion. If MTL is your thing, this might be your RTA to hold above all others.